Reveals the lawn that’s newly mown. For dead of night has swept the skies. From stillness comes a blink of light. And step out on the dewy ground. The firefly that I have found. To music of the cricket’s song. And lift my arm up to its height. I’ve cupped my hands and soon it’s done. I’ve caught the little ray of sun. For now the dark is all I see. And there the sad, gray creature stands. I part my hands and let it see. It lights up just once more for me. And lifts itself into the sky. That it will always, always fly. My light and joy will never die. 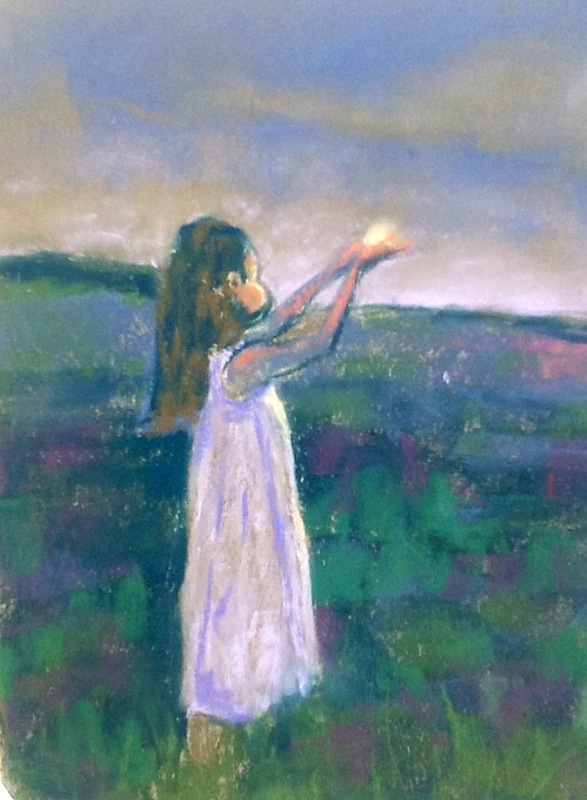 Julia, you have truly captured the magic, in both paint and verse, of a child (or the child in all of us), when we see and are able to hold a firefly for a moment in the deep summer evenings. Thank you. Okay-this is my new favorite!!! I love the poem and the painting is magical! If you ever make a print of this or sell this painting please let me know! Oh I just realized you posted this! Awesome! Thank you so for painting the poem, Juliana. It’s an honor to see the words come to life like that. Julia, I hope you read the comments. I have had the pleasure of hearing many more about your poem in person. Your writing is fantastic. I would love to paint another poem…please send the next one my way, and keep writing.